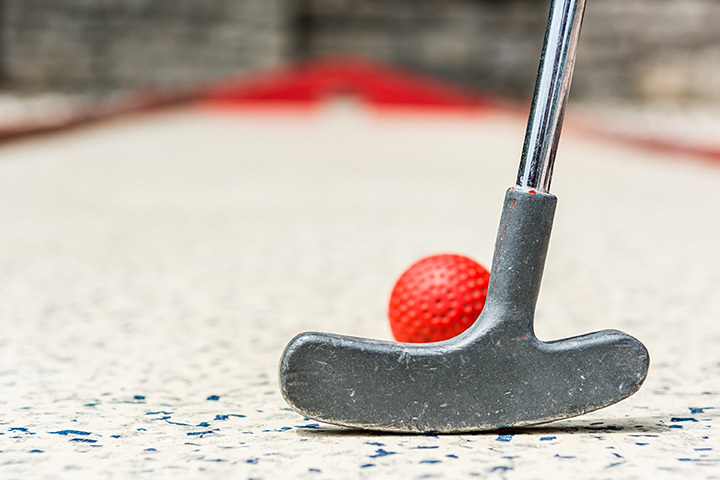 The 5 Best Mini Golf Courses in North Dakota! North Dakota is home to some of the best golf courses in the country, but not all golf lovers are interested in walking 18 holes or spending all day on the course. For those of us that love the thrill of trying to get a small ball into a seemingly tiny hole, mini golf is the answer. Although there are fewer mini golf courses than their larger counterpart, there are still plenty of opportunities for you to get your swing on. Thunder Road is North Dakota’s premier destination for all things fun. In addition to go carts, battings cages, bumper cars, and laser tag, Thunder Road also has two unique and challenging mini golf courses. Challenge yourself by the volcano and stay clear of the ponds, rivers, and waterfalls. The Sports Bubble is not often thought of as a mini golf location, but they have a new nine-hole course. Kids will have a ball on the course, which includes a kids’ fort and usable slide. The Bubble may be known for its golf simulators and driving range, but don’t underestimate its mini golf. Super Slide is the state’s oldest amusement location, and their attractions display that experience and know-how. The super slide itself may be the main attraction, but the mini golf course can hold its own as well. The park also has a rock climb, go carts, bouncy houses, and a Ferris wheel. Medora Mini Golf is fun for the whole family. This course features 18 holes and has a Western theme, with various “hazards” to navigate around. At just $3 for students and $7 for adults, this is a fun and affordable way to pass the time with the ones you love.